Guardians of the Galaxy #18 Review! Where's Richard Rider Nova? You are here: Home / Featured / Guardians of the Galaxy #18 Review! 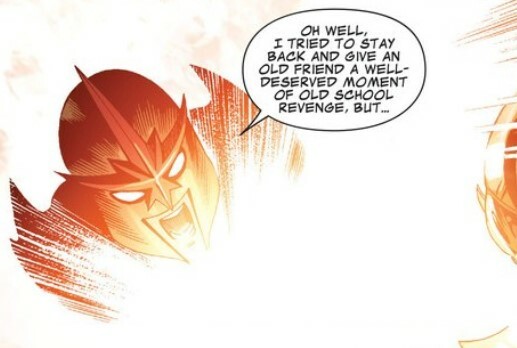 The Fate of Nova – Almost Revealed! Guardians of the Galaxy #18 Review! The Fate of Nova – Almost Revealed! What do you get when you cross Marvel’s biggest franchise of the year with the latest epic event, and make sure it’s penned by one of Marvel’s top franchise writers? The answer is: Guardians of the Galaxy #18, written by Brian Bendis, with art by Ed McGuinness. Original Sin is an arc like no other in Marvel history. Over on Mahmusecomics, I wrote A Guide to Original Sin and quoted Axel Alonso that this is “WikiLeaks with superheroes”. The only demand on a writer in scribing a tie-in is this: they have to reveal a secret. Original Sin has been on the cards for years, and Bendis has noted that he viewed this as “the perfect place to unveil this storyline”. You’ve got to admit, it’s an iconic scene! In a sense, though, this is a very strange decision. Original Sin is, by nature, a dramatic change to the status quo for countless heroes – and based heavily upon their histories. 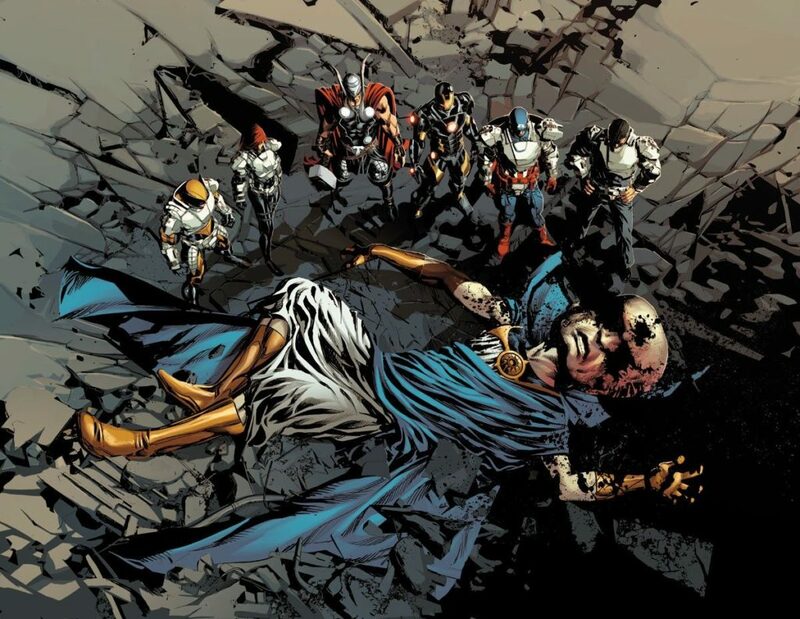 In the case of Guardians of the Galaxy #18 onwards, the storyline is revealing the secret of Peter Quill’s surviving The Thanos Imperative, a six-issue miniseries published in 2010. It also reveals the fate of Richard Rider, the hero known as Nova, who was trapped in a dying universe with Quill and Thanos at the end of that miniseries. Unlike the other two, Richard hasn’t been seen since. Think about it a little. The series has recently had a massive boost to its reputation (and potential readership) based on the popularity of a certain movie. You’d expect this to be a jumping-on point for fans, not a storyline that depends on your knowledge of events four years ago. And the Nova Centurions of the movie were very different to those of the comic books. For me, though, I’m interested in this book for another reason. You see, I’ve read comics for years, and Richard Rider is a character I’ve always felt had potential. Originally an overpowered teenager, Richard had been on the front lines of galactic war and had grown up – to the point where this human was leader of the Nova Corps, a cosmic powerhouse of tremendous levels, and frankly more of a leader figure than Captain America. In 2010, Ed Brubaker kicked off a series called Secret Avengers, and had plans for Nova. Those plans were sadly derailed when the decision was made for Richard to be one of the key deaths of The Thanos Imperative. The Nova I know best! Well, Thanos has come back (with style, as last year’s Infinity demonstrated). Peter Quill has come back, just in time to hit the big screen. But my personal favourite, a guy who I thought should be one of Marvel’s biggest heroes, hasn’t. And this plotline is going to tell me why. No, I’m not reading this as a diehard Guardians fanboy. I’m not reading this because the movie has made me dig all things Star-Lord. I’m reading this because I have a personal investment – a hero I grew up with has an untold story, one that looks likely to end in his death, and I want to read it. Does Bendis pull it off? All in all, the book is a strong beginning to an arc that should give resolution to a long-standing Marvel mystery. Bendis plays it very clever, using the narrative to naturally give explanations of everything weird and wacky we see as we experience Star-Lord’s memories – but I, for one, don’t feel he goes overkill on the description. He signposts enough for a new reader to work it out without boring someone who already knows it. That takes skill. Bendis also plays it very cleverly in another way. The Bendis titles – including Uncanny X-Men – have shied well clear of the main Original Sin event. In actual fact, not only is the main event not referenced here, but Bendis completely ignores the fact that Gamora’s part of it. It’s not too pretty from a continuity viewpoint (does Original Sin happen before or after this issue? ), but what is? Still, it ensures this series remains self-contained. Characterisation isn’t particularly deep, although the shining character of the book, in my view, is Gamora. Her opening scene is superb, and Bendis remembers the depth of her feelings for Richard Rider back in the day. As you can see, the art is very, very good! All in all, though, my one criticism is something I often say of Bendis’ writing: good, fun, but not much happens. Over in Uncanny X-Men, their Original Sin revelation hasn’t actually come out after two whole issues; in this issue, we only really learn a little. That being said, though, the issue resonates in a way that few others do; for once we haven’t really got a clue what’s going to happen to one of the heroes, and as a result the suspense is greater than in any comic I’ve read for a while. I find myself speculating: will Thanos do the deed? Will Drax’s angry “Mine” when Richard lands a heavy hit in against Thanos be a foreshadowing of something far darker? Or is there actually a chance (please!) that we’ll see Richard Rider come back to the Marvel Universe? Only time, or next issue, or the issue after, or possibly five issues’ time, depending on how Bendis intends to spin this out, will tell!